Nurse VS Reinhart: Who Has The Best Shot At Making Oilers Opening Night Roster? Training camp is just around the corner with the Edmonton Oilers wrapping up rookie camp this weekend in Penticton, British Columbia. It means that the real battles are coming soon in training camp. One of the more interesting battles is between two prospects Darnell Nurse and the newly acquired Griffin Reinhart as both look primed to earn a job on the Oilers defense this fall. The issue however comes down to the current logjam in the No. 5/6/7 spot in Edmonton right now between Erik Gryba, Andrew Ference, Nikita Nikitin, Brandon Davidson, Reinhart and Nurse. Because of this there is going to be some difficulty getting either of Reinhart and Nurse onto the roster without moving a veteran into the press box, something that is entirely likely with Ference and Nikitin before a deal can take place. If you look at this as a transition year on defense Andrej Sekera and Mark Fayne serve as a shut-down pairing with Oscar Klefbom and Justin Schultz being more of a puck-moving pair and Erik Gryba owning a spot on the third-pairing utility pair. The rest of the pieces bring different skill sets and some variety but not all bring the skills that this team needs which is strong puck-movers, something both Reinhart and Nurse are. Not to discount their defensive play either both have solid defensive awareness, something that made them both successful in their CHL careers. But between the two who has the best shot at making the Edmonton Oilers opening night roster? If anyone has been watching the Youngstars Rookie Tournament being played out of Penticton this month; it’s been the Darnell Nurse show. Nurse has shown in just a series of games that he has made tremendous strides this off-season in his physical fitness and looks to have added another gear to his game. Mind you he has been playing against other NHL prospects, some of them being fringe at best but he stands out anytime he is on the ice. That’s the hope that the Oilers have when it comes to Nurse in the long-term as he’s projected to be a future top-pairing defenseman for the hockey club. The Oilers haven’t had a true top-pairing defender since Chris Pronger left at the end of the 2005-06 season and the team has suffered because of it having cycled through Sheldon Souray, Lubomir Visnovsky and to a lesser extent Jeff Petry and Justin Schultz. Now Nurse isn’t a perfect prospect, there is no such thing. Nurse has put up decent offensive numbers in junior but his NHL ceiling doesn’t have him being a likely perrenial 60-point or even 50-point producer. He makes a great first pass out of the zone and is getting better and reading the play up ice but he’s a defense first player and so his offensive side is sometimes left on the table wanting more. That said he’s still young and with protected minutes in a No. 5/6 role this season and the opportunity to grow into second-unit PP and PK time as the year goes on could be the challenge a competitor like Nurse is suited for. Being a top-pair stud defenseman for Canada at the 2015 WJC? Check. Captaining your junior team for two seasons while playing the toughest minutes? Check. A Gold medal at the 2013 Ivan Hlinka tournament? Check. The only thing missing is an OHL Championship and Memorial Cup but let’s face it Nurse wasn’t on a team that had the ability to make that deep of a run to a championship. In the end Nurse, 20, gives them their best shot at a top-pairing defenseman and the first the club has drafted and developed since Paul Coffey (1980 – 6th overall). That’s 33-year’s between draft years and a down right travesty. Remember the spring of 2014 when everyone was throwing the Shea Weber projections at Reinhart when he was the star defenseman of the 2014 Memorial Cup Champion Edmonton Oil Kings? 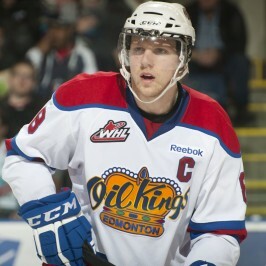 Or how about the 2012 NHL Draft when Reinhart shot up the draft rankings and the NY Islanders snagged him 4th overall? Reinhart was taken in one of the deepest defensive drafts in recent history and was taken ahead of Morgan Reilly (5th – Toronto), Hampus Lindholm (6th – Anaheim), Mathew Dumba (7th – Minnesota), Derrick Pouliot (8th – Pittsburgh), Jacob Trouba (9th – Winnipeg) and Slater Koekkoek (10th – Tampa Bay). It was a loaded class and only Ryan Murray (2nd – Columbus) was taken ahead of him. Everything said star. Then Reinhart turned pro two years after his draft and had a tumultuous season with the AHL Bridgeport Sound Tigers and GM Garth Snow decided the organization had enough depth on the backend to make him expendable. The Oilers swept in and traded their 15th and 33rd picks which the Islanders used to draft Matt Barzal out of Everett and they moved the other selection to Tampa Bay. 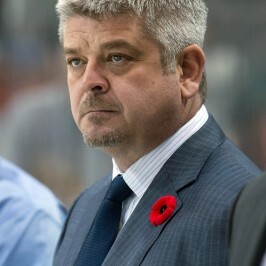 It was a heavy price but Reinhart has enough supporters in the Oilers system that saw him develop with the Oil Kings including new Director of Player Personnel Bob Green who was the GM of the Edmonton Oil Kings. Internally the management team believes in Griffin Reinhart to have a bounce back year, enough so that Peter Chiarelli proclaimed in early-July that Reinhart would make the team this year. Reinhart has all the tools to be a major player for the Oilers down the road; he’s a solid puck-mover and can help out on the PK. The downside however is that Reinhart was exposed in his first year as a pro for a lack of foot speed, something he has to work on if he wants to be a legit top-four or top-pairing defenseman in today’s NHL where speed and quickness are valued skills. If you’re looking at the present and where each prospect is in terms of development it looks like Nurse has the more NHL ready game of the two. Nurse has the skating edge between the two and is developing the same nastiness that Reinhart has. Then again there is the future outlook and the Oilers may want to give Nurse a valuable year in the AHL with the occasional call-up to the main roster so he can play 20-25 minutes per night against top competition in the AHL and be a sure-fire option to cement a permanent spot on the roster come 2016-17. The Oilers undoubtedly need to shop a defenseman or waive one of them because in the end the future lies with guys like Reinhart and Nurse coming in here and helping in the areas some of the other options in the No. 5/6 spot can’t. The best option is to throw both Reinhart and Nurse into the AHL as the Bakersfield Condors top-pairing for a solid year of development for one and a year to bounceback for the other. But if you have to make the bold move to put one of the two on the opening night roster and be willing to bump and demote someone like Nikitin, Nurse is the better of the two at the moment and deserves a spot in the third-pairing to start the year.